Light during a power outage is important for a lot more reasons than just getting things done after dark. The psychological benefits of a light source during a blackout are vital. 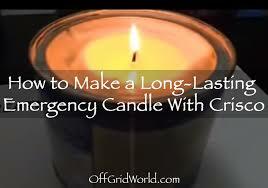 Make your Crisco candle safely. The internet is loaded with articles about sticking a wick into a can of Crisco shortening, lighting it up, and calling it a successful project. But actually, that's a terrible idea. That's because "cans" of Crisco aren't really cans. Not the metal type, anyway. They're cardboard tubes with metal on the top and the bottom. And we all know what happens when cardboard meets fire. Really, making a candle in a cardboard tube is an exercise in Darwin's law. You'll find all sorts of instructions on the internet for doing this, but that doesn't mean it's a good idea. If you're going to make Crisco candles, you really must move the Crisco into glass containers to be safe. This is a great way to use up those jars from storebought items like salsa, jam, or spaghetti sauce. Then you're repurposing instead of recycling and you're making this without spending any extra cash. Also, don't try to get fancy by adding stuff like flower petals. We're going for safety and simplicity. As well, most people report that adding essential oils is a bit of a waste of an expensive product as you don't really notice the scent. It's SO easy to make a Crisco candle. You don't need much in the way of supplies to make these successfully. This is an inexpensive wick kit with a braided wick that you can cut to the appropriate size and metal discs to keep the wicks where you want them. You can use any kind of vegetable shortening – it doesn't have to be name brand.